Warning: array_merge(): Argument #1 is not an array in _simpleads_render_ajax_template() (line 133 of /home/pdccourier/public_html/sites/all/modules/simpleads/includes/simpleads.helper.inc). Notice: Trying to get property of non-object in _simpleads_adgroup_settings() (line 343 of /home/pdccourier/public_html/sites/all/modules/simpleads/includes/simpleads.helper.inc). Warning: array_merge(): Argument #1 is not an array in _simpleads_render_ajax_template() (line 157 of /home/pdccourier/public_html/sites/all/modules/simpleads/includes/simpleads.helper.inc). Hunter Aspenson gains good yardage on the outside against visiting Cuba City. SWS caught nine passes for 125 yards. Jared Payne of the Blue-Golds lunges forward for extra yardage versus Cuba City. Nate Benish (3) follows the blocking of Preston Crowley-Lee Friday night. Jared Payne tries to jump past two defenders at the end of a good run. Fifth seeded Cuba City nipped host and fourth seeded Seneca/Wauzeka-Steuben 35-34 in overtime in a Division 6 high school football playoff game Friday night. SWS ended a fine season in which the Blue-Golds went 9-0 to win the Ridge and Valley Conference for the second straight year. SWS finished the season at 9-1. The Cubans (6-4) will now travel to Fennimore on Oct. 26. Carter Lomas hit a 31-yard field goal following a turnover in the first quarter to give the Blue-Golds a 3-0 advantage after one period. Cuba City scored on a 6-yard run and the extra point was good as the Cubans took a 7-3 lead in the second quarter. Lomas hauled in an 8-yard pass from Jared Payne and the extra point was good as SWS regained the lead 10-7 at the half. Cuba City scored on a 14-yard run in the third period and the PAT was good as the Cubans took a 14-10 lead. Nick Benish of SWS caught a 23-yard TD pass from Payne (PAT good) and the Blue-Golds led 17-14. The Cubans scored on a 23-yard pass (PAT good) to go up 21-17 after three quarters. Lomas connected on a 43-yard field goal to get the Blue-Golds to within 21-20 in the fourth quarter. Cuba City had a 40-yard TD run and the extra point was good as the Cubans increased their lead to 28-20. Gavin Ralph caught a 32-yard scoring pass from Payne, and the 2-point attempt was good as SWS tied the game at 28-28 to send the game into overtime. Benish scored on a 5-yard reception from Payne, but the 2-point conversion was no good as the Blue-Golds increased the margin to 34-28 in the overtime. Cuba City had a 5-yard TD run and the all-important extra point was good to give the Cubans the hard-fought victory in the overtime nailbiter. SWS rushed 48 times for 278 yards in the contest. Cuba City had 36 carries for 178 yards. Cuba City had 144 yards passing. SWS passed for 125 yards. Benish had 15 carries for 160 yards. Hunter Aspenson had 10 carries for 48 yards. Payne was 9 of 15 passing for 125 yards and 4 TDs. Ralph caught 2 passes for 46 yards and a TD. Benish hauled in 2 passes for 33 yards and a touchdown. 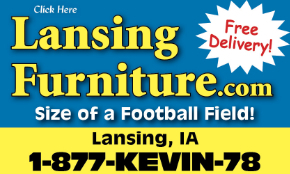 Weather Sponsored by Lansing Furniture.